We have all seen that infamous- "Help, I have fallen and I can't get up "commercial! One thing about them-they cost fees. Monthly fees that our senior citizen family members really can't afford at times. Did you know that VTech has Senior Citizen Phones that don't cost a monthly fee? All they have to have is a live phone line! Recently, VTech asked me if I would like to review their new CareLine Home Telephone System. I could not pass it up. Not only does this help with independent living, but it helps us keep in touch when we are not able to be around. Let me tell you more about it! -Photo Dials -Never forget whose number is whose. Program four frequently dialed phone numbers and attach a photo to each for convenient, one-touch dialing. -Voice Announce Caller ID- Always know who's calling, even when you're in the other room. All devices announce the names of your callers through the speakerphones- including the safety pendant. -Digital Answering System- Missed calls? The touch of a button retrieves all your messages. Check out the features for the Careline accessory handset! -Audio Assist- Need more help hearing what's being said? Use Audio Assist on our hearing-impaired phones to temporarily boost up the volume while you're on a call. -Large Screen- The cordless handset features a large, high-contrast display to make it easier to see who's calling. -Big Buttons- Oversized, lighted buttons make the handset super easy and comfortable to use. My favorite feature of the Careline Phone System would be the portable careline safety pendant! This is amazing because it can be charged on the base and it allows seniors to conveniently make and receive calls, listen to voicemail messages, review missed calls or receive programmed reminders for medication, appointments or other events. To use it you turn it on and the numbers you have programmed on the main corded phone on the photo dial are the numbers that will be called when you click 1 or 2 on the safety pendant. It also has voice commands! Command it to play messages and reminders, list missed calls, dial programmed numbers or confirm date and time. What do I think about it? Not only is this 100% affordable, but it is an amazing idea! My husbands grandparents will now be able to keep in touch in style, and we will be able to be assured they can get in contact with just a touch of a button! This beats monthly fees for a subscription service and is worth every penny! It is super easy to set up. Want to purchase the VTech CareLine Corded/Cordless Answering System with Pendant for a loved one in your life? You can purchase everything here for the retail price of only $119.95 and FREE SHIPPING! Need double the handsets or pendants? You can purchase those for extra on the website as well! Check it out for yourself and see what all they have to offer. You can also visit VTech on their social media to stay up to date with the latest! You can do so by visiting the links below! 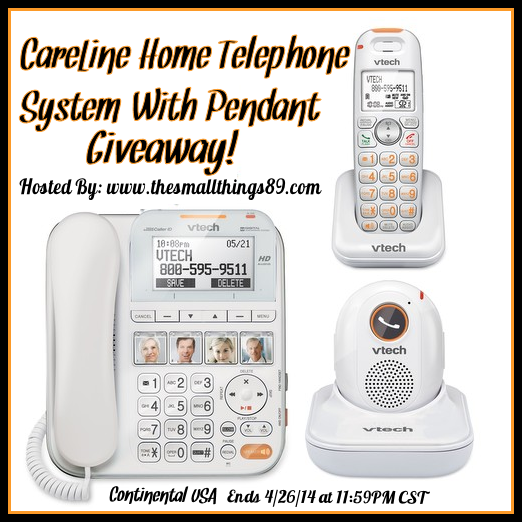 One lucky reader will win a CareLine Home Telephone System just like the one I featured here! This giveaway will run until 4/26/14 at 11:59PM CST. This giveaway is open to the Continental USA only. No purchase Necessary to enter. Enter with the giveaway tools below. Entrants must complete the mandatory entries to qualify, Completing all entries will increase your odds. Visit the bottom of my blog for complete rules. Goodluck. I really like the portable careline safety pendant, very cool! I like the One-Button Emergency Calls feature, it is good for someone who needs help quickly. My elderly father lives with me and this would be a great phone for him with the larger buttons and the Audio assist feature. My favorite feature is the medication reminder. This is an amazing phone! My favorite feature of the Careline Phone System would be the portable careline safety pendant! I like that I can record my medication reminders appointments and pre programmed numbers all for this litle gizmo. My favorite feature is the Portable Safety Pendant. I like that when you need help right away, the lightweight safety pendant is there for you. Plus, it's portable. I love the safety pendant! I love the safety and the the idea it can be purchased month to month with no long term plan. What is my favorite feature? EVERYTHING! Top of my list of favorite is the voice announce caller ID. I use to watch my father in law pick the ringing phone up and while trying his best to see who was calling, (caller ID) the phone would stop ringing. This is an awesome phone! One of my favorite features is being able to receive programmed reminders for medication, appointments or other events. My mother in-law is 85 and this would be perfect for her! I have two favorite features of this phone. The first one is the video buttons. I've never seen anything like them on a land line phone! My other favorite feature is the portable careline safety pendant. I like that it will remind people to take their medications and give reminders for appointments. I like that it has big buttons and large displays and speakerphones. I also like the Photo dials. I love the safety pendant neat for my parents.. I love the whole thing. I love the big numbers, that it always an issue with failing eyesight. The large display and the carry call pendant! It's perfect for when you need help. Thank you for such a great thoughtful giveaway! It's very easy to read, large type. What a benefit the portable careline safety pendant is for seniors. A little less to worry about with Grandma. I like the large buttons and pictures. It looks easy to use. My parents are elderly, my mom has dementia, diabetes, and is doing chemo!!! It's been crazy. This is the perfect phone for them. I am over there three times a day, but this would be even more piece of mind. If I don't win this, I am buying it. Thanks. My favorite feature is No Monthly Fees,this would be perfect for my mom who have hard time seeing small botton. I like that there is a safety pendant. IT's a whole lot better than the monthly monitored systems especially if the person it's for isn't quite in need of that yet. I really like the portable pendant. My grandfather used to be a really sharp man, but his health has declined quickly over the last few years. My grandmother doesn't like to leave him home alone for long because he might fall, remove his oxygen by accident or a number of other things. He gets upset when she is gone for a while and doesn't call, because he worries and gets fearful. However, his hearing is bad and he doesn't always hear her call. He also doesn't always dial her properly and he doesn't know how to listen to the machine anymore. The pendant, which basically does all of that at the push of a button AND is there for emergency situations when needed, is perfect for him!! My favorite thing is the pendant which my elderly mother really needs especially when she goes down the stairs to do laundry which I worry she will fall when no one is around. This would be perfect for her. Being able to reach out to someone is huge for me. I'm pretty healthy for my age (although I am considered disabled because of a degenerative nerve disease)& live alone in an isolated area in the country. About 3 months ago I got ill suddenly & was alone for 2 days. My doctor said it was life threatening so I would love to have this phone in case that happens again. I love that it has a simple hand held device to dial up to 2 numbers! This would be great for my brother who is in a nursing home!